Where does a giant international retailer turn when it needs innovative IT support? Michigan Technological University, of course. Target Corporation, with international headquarters in Minneapolis, is the first retail firm to participate in Michigan Tech’s signature Enterprise program. In the Enterprise program, teams of students work with a business or industry sponsor on a real-world problem that the sponsor would like the students to help solve. 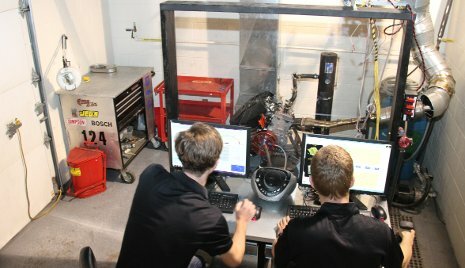 Three of Michigan Tech’s Advanced Motorsports Enterprise teams are working together—literally—for the first time, thanks to a $25,000 grant from the DENSO North America Foundation. The funding is enabling the Formula SAE, Supermileage Systems and Clean Snowmobile teams to share remodeled engine-lab space in the Advanced Technology Development Complex (ATDC) on Sharon Avenue in Houghton.